NDSU pharmaceutical sciences doctoral student Raquib Hasan’s research opportunities in the laboratory of assistant professor Amanda Brooks are rapidly moving him toward helping him fulfill his dreams. NDSU pharmaceutical sciences doctoral student Raquib Hasan believes helping people is his mission in life. His research opportunities in the laboratory of assistant professor Amanda Brooks are rapidly moving him toward that goal. Hasan is developing a special bone putty to be used to treat infected orthopedic surgeries. 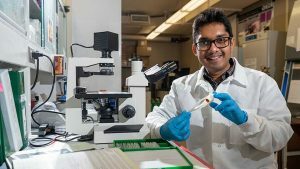 “Just like using putty to fill a hole in your wall, surgeons can use this putty to fill in holes in bones during operations like knee or hip replacements,” Hasan explained. “Bones can get infected, but this putty releases antibiotics to prevent infection. The putty also degrades away, so the bone will grow back, and everything is good.” His interest in the research is, in part, based on his personal experience. As a youth in his native Bangladesh, Hasan severely hurt his knee playing soccer. The injury required four surgeries, and he wants other patients to have an easier time recovering with protection against infection. Hasan points out that surgeons now use a bone cement that may later be removed through another surgical procedure. His putty is a better answer because it can be easily molded and applied. It’s also biodegradable, eliminating an additional removal surgery. All the individual ingredients of the putty have been approved by the Food and Drug administration. “We are hoping to get it to market as soon as possible so patients can get benefit out of it,” he said, noting trials in rats have shown very promising results. The next step is testing the putty in larger animals. He’s also working with a consultant on how to gain FDA approval. The research is garnering plenty of attention. Hasan won first place in the product category of NDSU’s 2018 Innovation Challenge and he recently was a finalist in NDSU’s Three Minute Thesis competition. Brooks also sees an exciting future for the work. The sales outlook for the putty looks bright, but that is not the basic reason for Hasan’s efforts. After earning his doctorate, Hasan hopes to continue researching product development either at a university or in industry. Start your NDSU experience by exploring the graduate degree opportunities available through the Graduate School.